Dr. Uttam Chandra Upadhyay, born on August 1, 1939 in the Balia District of Uttar Pradesh, took over the charge of office of the Vice-Chancellor, Assam Agricultural University, Jorhat on December 1, 1992. An agriculture graduate from Banaras Hindu University (1952), Dr. Upadhyay completed his Master’s from Government College of Agriculture, Kanpur in 1954 and Ph.D. from Marathwada Agricultural University, Parbhani in 1975. He began his professional career as a Junior Agronomical Assistant under U.P. Government in 1954 and was in the teaching & research profession till 1972 as Lecturer in Agronomy, Nagpur (1955-63); Professor of Agronomy, MAU, Parbhani (1963-71); Pulse Agronomist, PKV, Akola (1971-72). 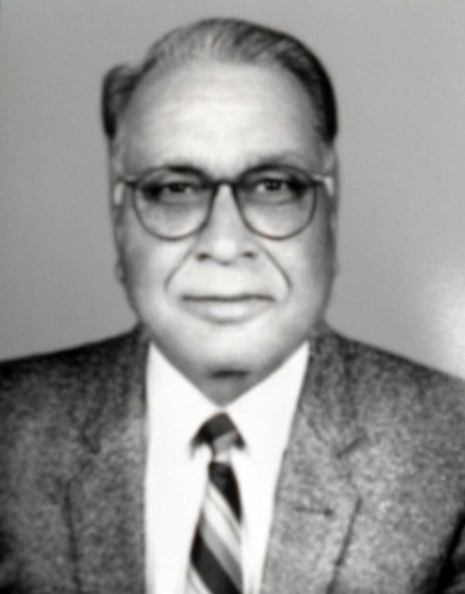 Thereafter, he served in various administrative cadres such as Associate Dean & Principal (1972-76); Dean, Faculty of Agriculture (1977-80); Director of Research & Dean, Faculty of Home Science (1980-June, 1981) in the Marathwada Agricultural University, Parbhani; Assistant Director General, Education, ICAR (June 1981- May, 1989); Vice-Chancellor, Narendra Dev University of Agriculture & Technology (6th May, 1989 – 5th May, 1992) before joining Assam Agricultural University, Jorhat. During the period, he made significant contribution in Sorghum Agronomy and Weed Management of different crops for the benefit of the farmers of Maharashtra. In addition, his contribution to Agricultural education in India is noteworthy. He has altogether 100 publications to his credit of which 98 were research & popular articles, 1 Indian Literature on Pulses (1966-1980) and 1 Practical Manual on Weed Control. He acted as member of around 15 prestigious technical bodies, notable amongst them were Sorghum Group of National Commission on Agriculture Steering Committee of Advanced Centre of Educational Technology at NAARM, Hyderabad; Editor in Chief, Indian Journal of Agronomy etc. He visited a good number of countries such as Philippines, Thailand, China, Rome, Canada and Botswana etc. He was also the recipient of the “HEXAMAR” Award for writing/ a brochure on Pigeon Pea and Chick Pea Cultivation.